Click on the underlined songs to hear a RealAudio sample. Bassist Monte Thomas who played with Paul on "Live in Seattle" gave a copy of the CD to Peter Green, founder of Fleetwwod Mac. When Monte next saw Peter he said "I gave it a listen, Bloody good guitarist!......Bloody good guitarist!........e's not on the bill tonight is e?" 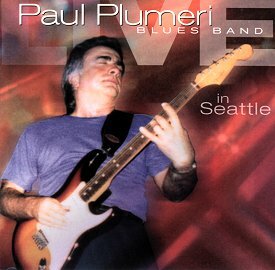 The Making of "Live In Seattle"
Guitarist, singer and songwriter Paul Plumeri has certainly paid his dues as a bluesman. He's been playing professionally around the greater Trenton area and up and down the East Coast since the early 1970's. Once the guitarist for Duke Williams and the Extremes, a group that recorded for Capricorn Records in the 1970's and 80's, he's since begun working in a trio under his own name. While the record companies haven't exactly beaten the doors to sign him to a multi-album deal, that's not what music from the heart is necessarily about, anyway. It's more about the right mix of material, and that's what "Live In Seattle" delivers, in spades. You have in your hands something special: a well-produced live recording that represents one night of Plumeri's finely crafted guitar playing magic, recorded in Seattle. As the disc demonstrates, it's not just any night in Seattle; it's a night at the Paradox Theatre in Seattle after nine nights of club shows. Extremely well-recorded and well-produced, there's a great musical dialog going on between Plumeri, his bassist and drummer, with just the right amount of ambience from the theater audience. "This whole project started with Monte," Plumeri explains, referring to legendary Seattle-area bass player Monte Thomas, who worked with Plumeri in the 1970s as a sound engineer with Duke Williams and the Extremes. Plumeri worked with Thomas and drummer Conrad Ormsby on two earlier trips to Seattle. He thought it would be a nice idea to try and document the shows, if for nothing else than as a keepsake of the shows the trio played together in Seattle. Prior to this tour, a week before and leading up to Labor Day Weekend in 2000, Plumeri made tours, booked by bassist Thomas, in 1996 and 1997. "The last tour in 1997, I did maybe eight shows while I was out there. Then we did a bit of recording as well, nothing that will probably ever be released," the Trenton, N.J. -based Plumeri explained. "I told them it would be great if we could record some of these theatre shows we were doing on the 2000 trip I made out there," he explained. Plumeri met bassist Monte "Mondo" Thomas in Florida more than 25 years ago, when Thomas was a live sound engineer for road shows by Duke Williams and The Extremes. The Paradox Theatre in Seattle is one of these vintage 1930's-era theaters that still have lots of sound-absorbing wood on the walls. "What makes this record special," Thomas explained from his home base in Seattle, "is that we had a great sound in there, a really good audience and it was a holiday weekend. It was also after a string of eight or nine gigs that I had put together for us. It was loose but we were very tight at the same time." "This was my third time out there playing with these guys, and everything was made so easy for me through Monte's efforts. All I had to do was bring my guitar, get off the plane, go one night's rehearsal and then do the shows." One night of rehearsal in late August of 2000 was followed by nine club shows and the whole trip was capped off with a well-promoted show at the Paradox Theatre. Listen to the subtlety of Plumeri's playing on "Philene" or the way the band locks into a groove on "T-Bone Shuffle" and "Hey Joe" and you'll hear just how well a seasoned band of veteran musicians understands the intricacies of ensemble playing. Bassist Thomas, who has played with the bands of Pat Travers, Jimmy Buffett, Gregg Allman and others, points out that Seattle, for those who don't know much about it or have never been there, is a surprisingly hip music town. Born in Portland, Oregon, Thomas has lived in Florida, New Jersey and Colorado before finally making his way back home to the northwest. "We have a very enthusiastic music scene here. This is the only place I've ever lived where festivals run end to end through the fall, winter, spring and summer. Even at our club shows, we were playing in front of a couple hundred people every night," Thomas said. Thomas stressed that what makes this disc so special is the theatre setting and the combined experience of three veteran musicians. Drummer Conrad Ormsby is "the single hardest working, most sought-after drummer in the entire Puget Sound area," Thomas said. He added: "We were primed. We had played for a solid week and I think we took only one night off in ten days. We had played for a nine-day stretch and we got it to the point that each night was significantly better than the previous night's performance. We noted the progress and finally, we got the recording together. Our goal was to simply document the performance, and we had no designs on putting out a record." But after letting the tapes sit for a few months, Thomas went back to a studio to listen. "I went into the studio a few months later and was quite surprised. There were very few mistakes in the performance, the recording was really clear and audible and so we started the process where I would go in work one day a week for a few weeks and I just started submitting these edits to Paul back in New Jersey. Over the course of a few months, we came up with the right balance of material." 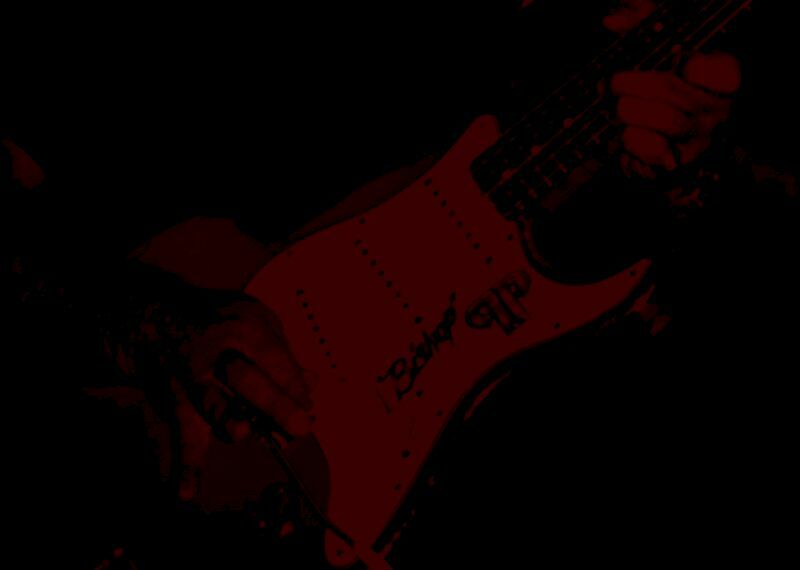 And in the end, the right balance of material is what it's all about for a veteran guitarist like Plumeri. Host of THE LOW-BUDGET BLUES program on Thursday nights at WRSU, 88.7 FM, the radio station of Rutgers University, and writes about blues and jazz for the Asbury Park Press. Mention a specific area of the country, and the automatic reaction of most persons would be to conjure up a mental image based on what they've seen, read or heard in assorted media. However, I've discovered that any stereotypical perceptions I might have had about the state of New Jersey as well as its musical talent were just as misguided as some snob's image of Bubbaland. But after hearing THE BISHOP OF THE BLUES, it was yours truly who called the p.r. company asking them to put me in touch with Plumeri, and I couldn't recall ever having done that after listening to an unsolicited album by a player I'd never heard of. For what my opinion's worth, I think blues-based guitar music has the potential to be full of more clichés than any other genre, and that's why Paul's guitar work is such a breath of fresh air. Here is a veteran, journeyman Strat-slinger who is purveying something different. Plumeri's riffs are incredibly unique his style seems to be based on wringing out melodic runs from unusual chord structures. Moreover, he knows how to use a vibrato arm/whammy bar the way it was originally intended to be used. Paul confidently asserted that "Jersey Blues" is a valid term, and he proffered such music in a very listenable manner on his first album. Now comes Paul's new live album, recorded at the Paradox in Seattle. Assisted by Conrad Ormsby on drums and Monte Thomas on an old P-Bass, the Bishop delivers a definitive club date, deftly romping through cover and originals alike. The fact that these two sidemen are Seattle-based simply underlines the professionalism of all three participants - the compatibility of these players' abilities is what being a pro is all about. Plumeri's unique chord-based riffs are all over this new offer, from the first track, an original instrumental titled "Get On With It" through the raucous cover of "Hey Joe" that closes the performance. Not only is this concert impressive, it also sounds like it was a lot of fun. One point about Paul's instrument of choice for this specific gig needs to be pointed out: He told me that the guitar he used was a "hardtail" Fender Stratocaster; his instrument didn't have a vibrato bar, so all of the chord modulations were, done with his left hand. Amazing. Paul Plumeri epitomizes what it's like to be a musical craftsman. He presents his original songs as well as arrangements of other tunes in a manner that shows he's been playing his trade for years. Paul's Jersey blues are definitely different, and this new live album confirms such. And as for payola for writing this, I've advised Paul that he owes me (1) a damn good jam session on songs like "Crossroads", "Black Magic Woman" or maybe "Further On Up The Road" (i.e., tunes I could handle on bass, and (2) dinner at Mastori's Diner. For a printable order form.